A shockwave is a “percussive sound wave”. 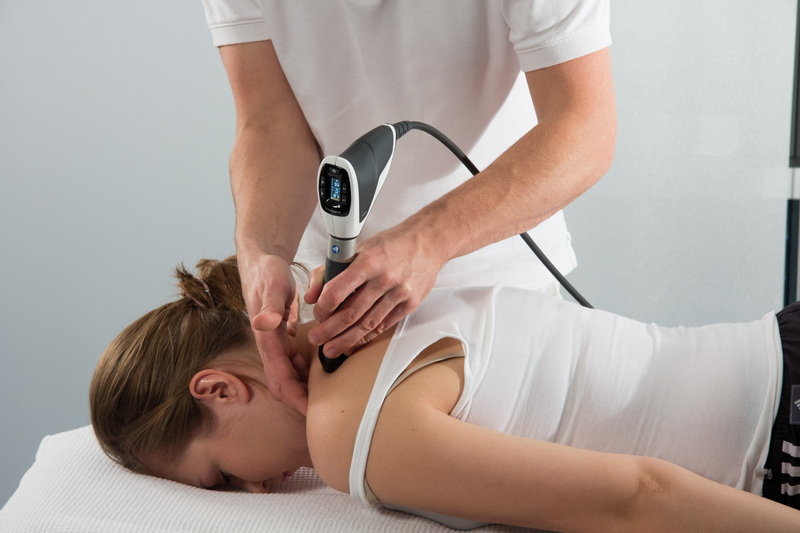 Shockwave Therapy sends acoustic shockwaves into bone or soft tissue, in effect re-injuring the area on a cellular level and breaking up the scar tissue that has penetrated tendons and ligaments. The controlled re-injuring of tissue allows the body to regenerate blood vessels and bone cells. The resulting re-vascularization, leads to faster healing, a physiological induction of blood and lymphatic drainage decreases pain and sensitivity of the treated tissue, and often a return to pre-injury activity levels. Only 34 years have passed since the first kidney stone patient was treated successfully with shock waves. What started as an experiment is now a success story: patients from around the globe benefit from the treatment. Today the waves have a wide range of application and physicians use them not only in urology but also in orthopaedics, cardiology, dermatology and veterinary medicine. New research results in the fields of wound healing and neurologic diseases show that shock waves will become even more important in the future. The first use for shock waves was in 1980 in Munich, Germany. A university hospital of the LMU Munich physicians began treating a patient with a kidney stone with a new method for the very first time. Instead of removing the stone surgically they wanted to break up the stone with shock waves. The principle behind the technology: shock waves are high-energy, audible acoustic waves that occur in the atmosphere. For example during a lightning storm or when a plane breaks the sound barrier. When disintegrating kidney stones, shock waves are generated outside the body and transmitted to the stone inside the body. When the energy reaches the kidney stone, the stone is fragmented into small pieces that then can naturally leave the body. The experiment at the university hospital in Munich was successful. Shortly after the first treatment the so-called Extracorporeal Shock Wave Lithotripsy (ESWL) was regarded as a revolution. The thousandth patient was treated in 1984 and until today millions of other patients have been treated as well. Since then, the medical potential of shock waves has been explored continuously. Orthopaedists and Sports Medicine Physicians discovered the versatile waves in the early 1990s. They found out that shock waves do not only disintegrate stones but also initiate healing processes when transmitted into painful body areas. This effect, however, requires far lower shock wave energy levels. Radial shock wave therapy (rSWT) is a modern and highly effective treatment method: high-energy sound waves are introduced into the painful areas of the body. With this innovative therapy approach, pathological alterations of tendons, ligaments, capsules, muscles and bones can be eliminated systematically. Even Stress Fractures and Shin Splints. By chance it was discovered that shock waves can also be used in dermatology and aesthetic medicine. In these medical fields they are known as “Acoustic Wave Therapy” (AWT). During the treatment of athletes, physicians found out that acoustic waves also have a skin-tightening effect and they strengthen connective tissue. In recent years, physicians have been successfully using them to treat scars, pregnancy stretch marks and cellulite. We are currently researching the application of shockwave therapy to fascial distortions and the dermatological use in physiotherapy. Print this voucher pdf and come in for an introduction to radial Shockwave Therapy, or give it to someone you suffering from muscle, joint or myofascial pain today!